Attractive and comfortable family estate, thanks to standard fit self-levelling suspension. Available with all-wheel drive. Flat load floor with up to 1700 litres of boot space. Noisy engines. Sluggish four-wheel drive performance. German rivals provide better in-car entertainment. The XF Sportbrake is a large and elegant estate, with great practicality and a rewarding drive. 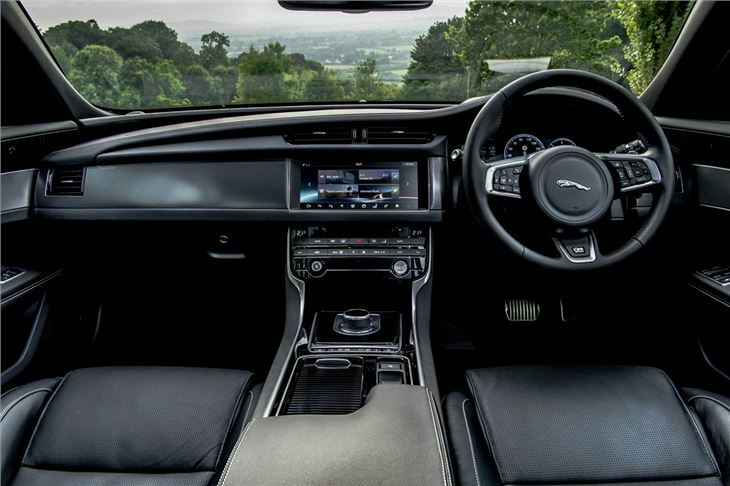 However, while undeniably attractive and luxurious, the family friendly Jaguar falls a little short against its German rivals when it comes to diesel refinement and in-car tech. 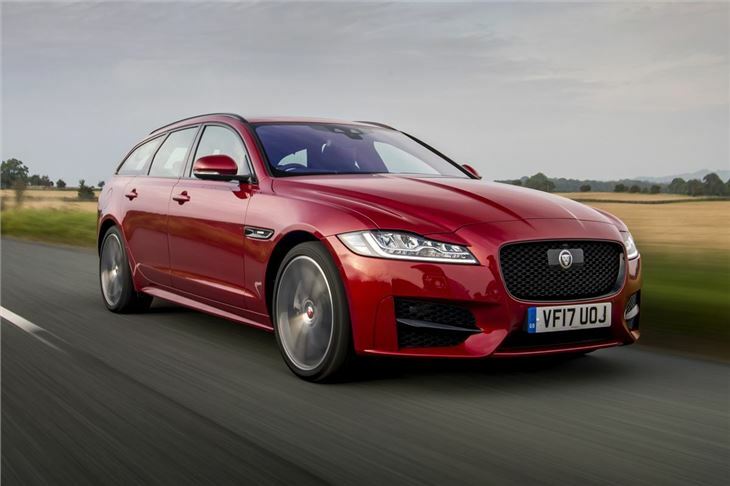 Like the BMW 5 Series Touring, Audi A6 Avant and Mercedes-Benz E-Class Estate, the Jaguar XF Sportbrake is an executive mix of style, luxury and space. At the business end of things, the Jaguar matches most of its rivals on storage, with 565 litres of boot space when the rear seats are in place. It also provides a completely flat floor and 1700 litres when you flatten the rear bench, while accessing the wide boot is easy with a powered tailgate fitted as standard. 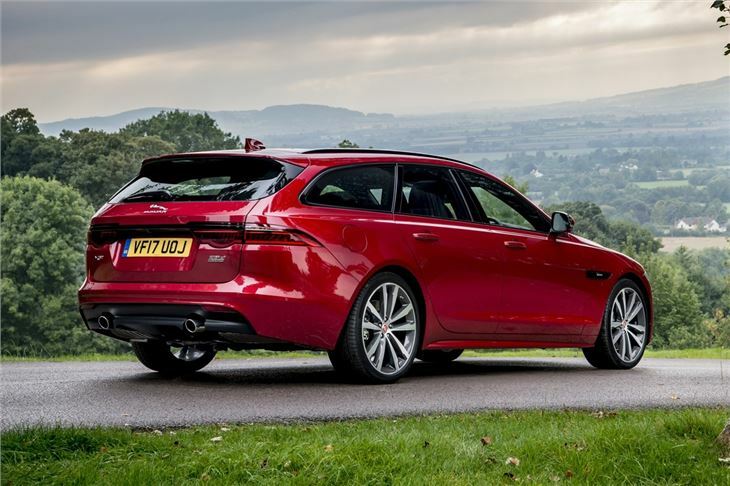 As well as a big boot, the swoopy-styled XF estate gets an opulent interior, with enough space to transport a family of four in limo-like comfort. Indeed, even entry-level models are kitted out in leather and soft-touch materials, along with smart features such as ambient interior lighting and in-car WiFi. Touchscreen infotainment has also been upgraded, although its useability remains a long way short of the tech found in the latest Audis and BMWs. Like the saloon, the XF Sportbrake is extremely good to drive, with smooth and responsive steering that allows the driver to reach its performance limits with confidence. The self-levelling rear Integral-Link air suspension should ensure effortless towing for those more interested in the practicality of the XF, with it capable of shifting up to 2000kg - more than enough to cope with a standard caravan or horsebox. Most buyers will choose diesel and the line-up includes three 2.0-litre engines, plus a performance focussed 3.0-litre V6. We'd recommend the 180PS diesel - returning an advertised 60.1 - 61.4mpg. Almost all powertrains are linked to rear-wheel drive and an eight-speed auto as standard, although four-wheel drive can be specified. Petrol buyers might feel a little short-changed, however, with just one option - a 250PS 2.0-litre engine. 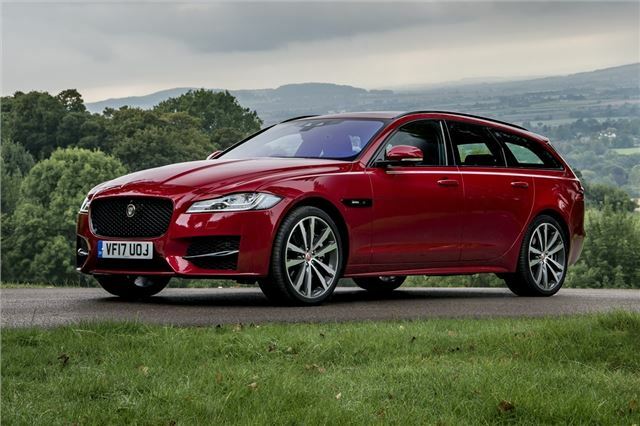 Jaguar makes no bones about the fact that the XF Sportbrake's designed for those who want a large family car with dynamic handling and a comfortable ride quality. This means, for the most part, it feels very close to the standard XF saloon on the road, with positive steering and excellent composure at motorway speeds. However, a few areas blot the Sportbrake's report card. The diesels are gruff at start-up and noisy at low speeds, while the engine stop/start system is crude in its operation. 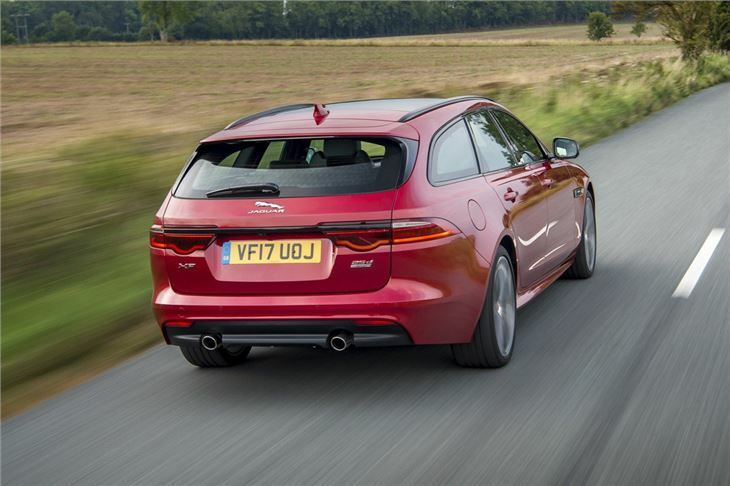 The XF Sportbrake doesn’t get anything dramatically bad, but equally it doesn’t excel in any particular area either. It is comfortable, efficient and luxurious. And for many family car buyers that will be more than enough for it to be a likeable alternative to the current crop of Germany executive estates.